Item # 317050 Stash Points: 595 (?) This is the number of points you get in The Zumiez Stash for purchasing this item. Stash points are redeemable for exclusive rewards only available to Zumiez Stash members. To redeem your points check out the rewards catalog on thestash.zumiez.com. Show off your quirky personality while providing the interior of your whip fresh aromas with Stickie Bandit's Alien Ride Air Freshener. This accessory was given the brand's signature "Get Bucked" Summer Nights scent and featured with a humorous double sided graphic of a green alien riding a Tyrannosaurus Rex. 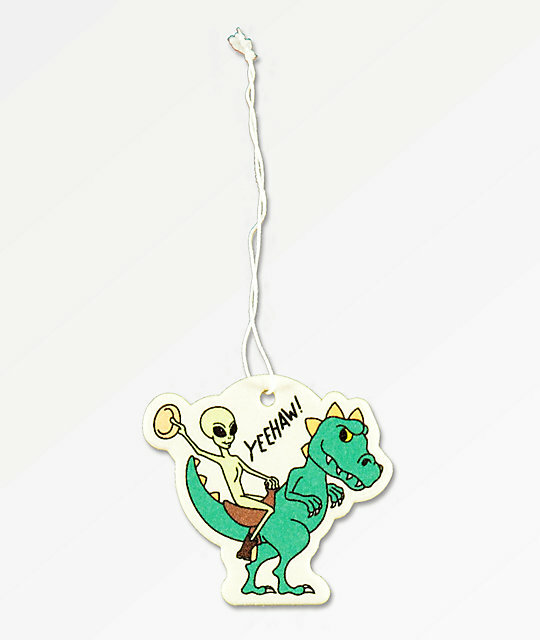 Alien Ride Air Freshener from Stickie Bandits. Stickie Bandit's "Get Bucked" Summer Nights scent. 3" x 2.75" | 8cm x 7cm (approx. ).